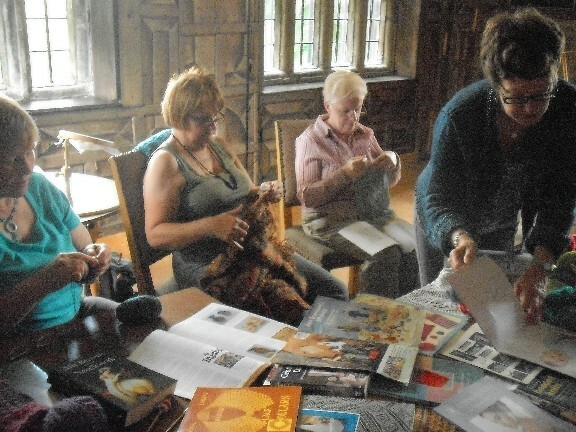 I have just come back from a lovely afternoon at Oakwell – my evening knitting group had been invited as part of a Heritage Weekend where lots of properties are open for free across the country. 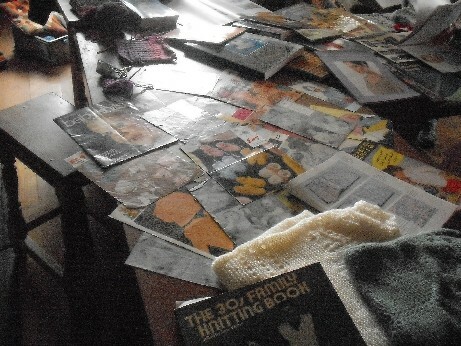 Our task was to sit in the amazing Painted Chamber and knit and talk to the public about knitting – how hard! The ‘painted’ title refers to the wood panelling – though the vertical and horizontals panels are real the rest of the 3D effects are painted on. 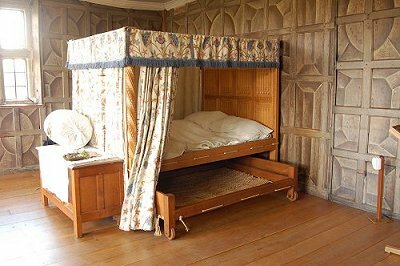 The room reminded me very much of the bedrooms in Tatton Hall that we visit every June – with again beautiful bed hangings. 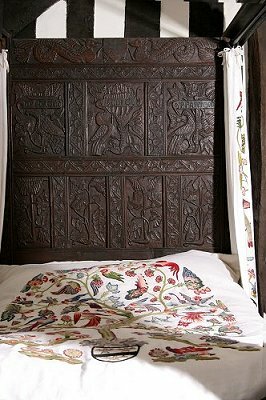 It was such a privilege to be in that room – especially when we were told that was where the ladies of the house used to sit, embroider and gossip! There were 5 of us there today – others will be there tomorrow – we had two tables with old patterns, examples of things that we had knitted and crocheted and modern examples of fun knitting patterns for the kids to look at. 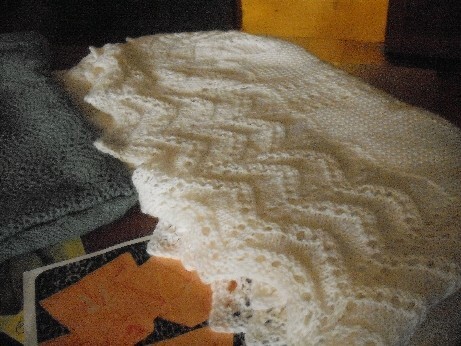 the really lovely thing was that so many people had owned and knitted the baby patterns we had on display, or talked about their Mums and Grannies knitting – there was a real wealth of social history that people wanted to share. We met a man who knew someone who had modelled for Patons knitting patterns in his youth, a women whose Mum was a test knitter for the same company, and someone whose Mum had knitted string vests for priests. Apologies for the quality of these pics of our display – the light was not good! Debbie's collection of vintage patterns - there were some lovely garments for men! These women are all very good knitters or crocheters – Kath’s speciality is socks, Pauline’s is crocheted jackets and scarves, Pamela’s is lace knitting and Debbie makes beautiful baby garments. I have learnt a lot from them in the year I have been going to the group. This year I have really improved on basic shaping and have learnt lace. 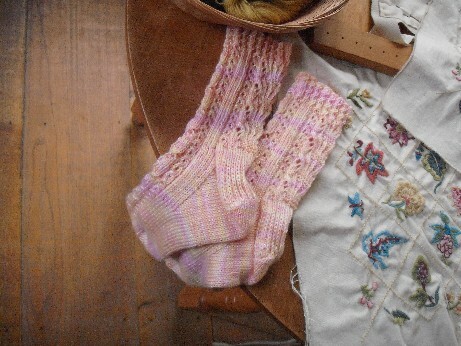 Next year it is going to be double-pointed and circular needles so I can do my first pair of socks! 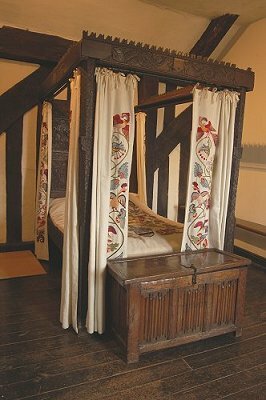 I did not get much chance to look round the rest of the Hall as we were so busy but did have a little peek in the room next door which had another wonderful set of bed hangings. These crewelwork reproductions were done by the Friends of Oakwell Broiderer’s group (another idea for if I ever have more time!). Pics again from the Friends of Oakwell website. As well as all the crewelwork the Friends have also done lots of needlepoint cushions, chair seats etc so it is well worth a visit if you like textiles! Hope that you are having a good weekend – thanks for visiting! 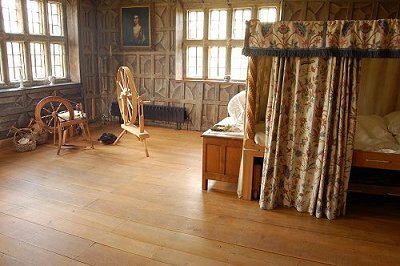 Hi Alison – what a lovely historic house to do a knitting demonstration! You all look as if you had a good time and it’s a while since I visited Oakwell Hall, a beautiful old house. Will be in touch re lunch.